Another interesting facet of Integrative Process is that what you are working ON is not really what you are working FOR. A building is not the end goal in the project for a university. It is a place to learn about science, or a place in which students will live or commune. What you’re working for is support of those goals in that endeavor. Even more broadly, you are creating this place/experience so the university can remain viable for years to come and continue its mission of education and community ties. Even more so, this viability means that the students who graduate can use the education they have received to innovate, prosper, and positively affect the world. Things change when you realize you are not merely designing a building, but supporting the future state of our communities and our shared ecological, planet-wide systems. Another way to address this is to consider the five stakeholders in all projects. And by project I mean any work that affects process, product, or people. The five stakeholders you should seek to consider are the investors, the co-creators, the users, the community, and the earth. Let’s understand why this is important by identifying each, and touching on their interdependence, and the information they bring to your work. Investors – of time, money, energy, insights. They have a stake in the game (stakeholders) because of these things they are putting into the stew. They rightly expect to partake of the results in some way, be it pride of involvement, financial return, or support of some aspect of their own mission/goals. Investors can be valuable in many ways including in defining outcomes that measure success in a way that can support future endeavors. Co-creators – there is huge involvement when someone taps your creative spirit. There is also the stress of creation and labor needed to gain the birth of the result. Co-creators benefit from the achievement in many ways similar to investors though the return is more spiritual and less tangible. Exciting co-creators improves innovation and creates a spirit of partnership in the work. 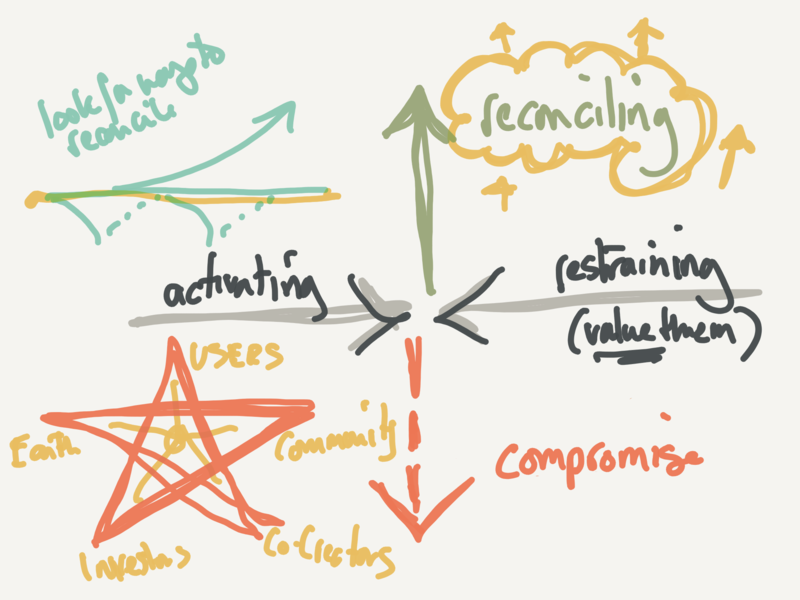 Users – this stakeholder group benefits directly from the product or resulting change. Users are those who live and learn in the building, as well as visitors and staff. And users can be of great benefit to the process of discovery, goal setting, and creation if you can engage them and access their inputs early in the planning stages. 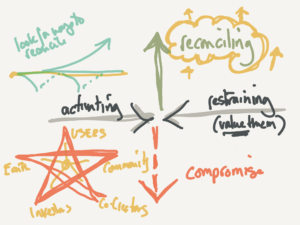 Community – community is the label for the nested system a bit larger than the direct users. There are many benefits to this stakeholder group if you can consider them in the planning, and many benefits to the work from this consideration. In a building this can be optimization of use patterns or connection to transit or a relationship strengthening the mission. It can be communal sharing of resources or spaces that helps to control size and costs, while obtaining the needed programmatic goals. The first step in resiliency is knowing your neighbors, so resiliency increases when a project works to support the community which it is also supported by. Earth – this is the mother-load, truly. If we design and build with the ecological systems in consideration, we can reap impressive benefits to the project while we support those nurturing and vibrant systems. We can do so much, so much more effectively. It’s less about doing less bad, and totally about improving beyond what you thought was possible. What happens when the smallest system you consider is the watershed? Transformation of your work and the effect of your work. In doing resiliency projects in Brooklyn, our team is not only asking how we can protect and make this one community more resilient, but how we can do it by supporting ecological environments in the bay with oyster castles and nature-informed design. We are also asking how our work will affect the downstream communities, and all of Jamaica Bay. This question has revealed synergies with other projects underway at the federal and city levels, making all of the projects more effective. 1) Understand and amplify the PURPOSE for the project, beyond the short-term product of the work. In this way all opportunities can be recognized. 2) Assess the benefits to the five stakeholders groups. More specifically, use the insights from the stakeholder group to maximize the beneficial interdependencies.